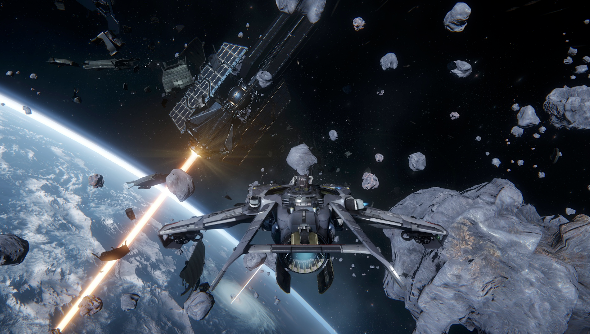 Is Star Citizen worth playing? Setting aside the persistent charges of feature creep and the question of whether or not Chris Roberts has gotten himself trapped in a Tholian Web of ever-tightening stretch goals, we concentrate instead on what really matters – what Star Citizen is like to play in its current form. After all, in spite of a protracted development that has recently attracted a series of attacks from perennial industry bittervet Derek Smart, a significant portion of the mega-crowdfunded space game has been available to play for more than a year now. That portion, dubbed Arena Commander, is to the future Star Citizen what the early alpha phase of development was to a nascent Elite: Dangerous. Beyond it’s teasing hangar spaces that still function as the game’s first glimpse of things to come, Arena Commander offers a tutorial sequence bundled up with a couple of skirmish systems and multiplayer modes through which early adopters – of which there are now close to a million – can fight, race, or just bounce around its VR-inspired boundaries. 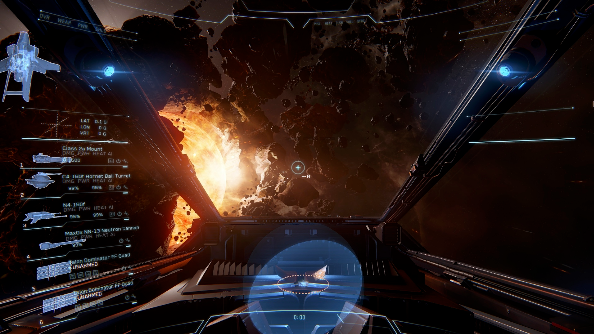 Unlike Elite’s early testbed, however, Arena Commander has received considerably less attention than it perhaps deserves, likely on account the many expensive ship designs and other wallet-boggling upgrades that Cloud Imperium keep adding to its online store in order to boost Star Citizen’s record-setting development fund, which in spite of an apparent slowdown in income is on target to exceed $90m before the end of the year. Thankfully, for those who’d rather pay standard price for Star Citizen entry, you don’t need to put down $330 on a Constellation Aquila in order to enjoy the fruits of others’ investment. Early access is acquired by way of one of two starter packs costing a relatively cheap and cheerful $54 (£35), each coming with a basic ship, immediate access to Arena Commander and eventual access to the completed Star Citizen and it’s single-player campaign, Squadron 42. Unfortunately those basic ships are properly basic, being rather less in terms of form or function than Elite’s standard issue Sidewinder, which perhaps explains why so many of the game’s backers have invested their dollars in filling their hangers. The point is that you don’t have to. You may not want to, of course. I certainly felt a degree of smug relief at having resisted the pull of CIG’s impressive string of ship promo videos, when after installing the latest version of the game I ended up spending an entire afternoon editing xml files in order to set up a working control system. The game claims to support a number of joysticks by default, as well as gamepad and keyboard and mouse, but that support isn’t nearly as evolved as Elite’s was at a similarly early stage. The default settings don’t seem at all to have been tuned for average use, and with so many attributes to pore over, such as sensitivity curves for each axis, it can take hours of flicking between game and options screen to just edge towards a control profile that suits even just your basic needs. It is however worth putting the time in, especially if you own a half-decent stick, because of course a fine degree of control over your vessel is of such fundamental appeal. It is worth the effort too because the mechanics of Star Citizen’s flight and combat model, even without much in the way of content, is so reminiscent of the space combat games of old, especially those it directly draws inspiration from – Wing Commander III and IV, Starlancer and the undoubted apex of the space combat genre, the Freespace games – that after one or two waves of enemies you can almost hear the click of something falling into place, somewhere between that part of the brain that swims in nostalgia and the more elevated section where hopeful expectation resides. For all it’s repurposing of classic space game material, Arena Commander is by no means perfect. The weapon effects are weedy (though perhaps that’s down to having a weedy ship) and the visual effects during combat seem more like placeholder animations than anything close to completion. Multiplayer performance was spotty at best, as I was thrown back to my hanger almost as often as I managed to start a battle. Curiously for a game aiming for the stars in terms of pixel heft, graphical performance was good, more impressive in the heat of battle in fact than when exploring the ship hangar. What I did particularly enjoy was the details in the HUD and cockpit instrumentation, coming between the functional switches of a 1970s jetfighter and the flickering holographic overlays of a trusty 90s space sim. 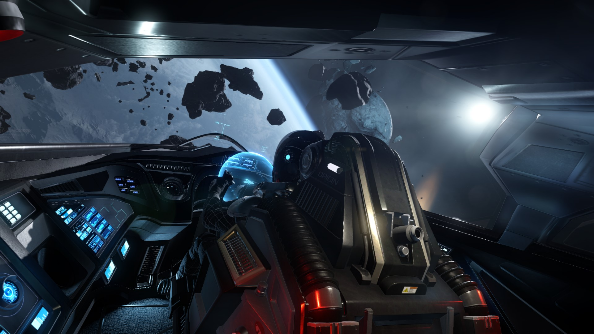 Elite’s cockpits are more designed around the function of the ship which is to the benefit of the game’s immersive qualities, but it seems Star Citizen’s control interiors are geared around much more habitual pleasures. These are ships designed to engender a sense of fun rather than adventure, which is entirely fitting in the context of where the game is currently. While the content people are eager to consume seems as distant as ever, the foundations of Star Citizen and the mechanics of flight are considerably more solid than they were a year ago. As much as some might be frustrated by the pace of development and remain skeptical of CIG’s ability to deliver on its ambition, Roberts and his crew are probably going about things in the right order. It’s arguable however whether the game is currently worth the £35 entry price, for whilst it seems that many have been happy to spend much more and feel more than justified in their purchases, against the current and immediate feature set (a social module is coming soon) and taking into account the competition, there’s just not quite enough in the game nor is the pace of feature releases enough to ensure sustained enjoyment. Of course when you factor in the scope of the game into which you’re investing, the past glories of it’s creator and the financial backing at his disposal, then that changes things considerably. Leave it too long and you may find Star Citizen is a far more expensive ship to board than it is now, as seems to be the case with most crowdfunded games after launch, and for some reason even more so with space games. But that’s enough sly digging at the Elite: Dangerous Horizons pricing structure. We’ll tackle that one another day. Star Citizen Arena Commander is free to play for this weekend only. Until Monday 17th August you can fly, race, and fight in a good selection of ships. All you need to do is head to the Arena Commander website and use the codeGamescom2015 as your Fly Free coupon.